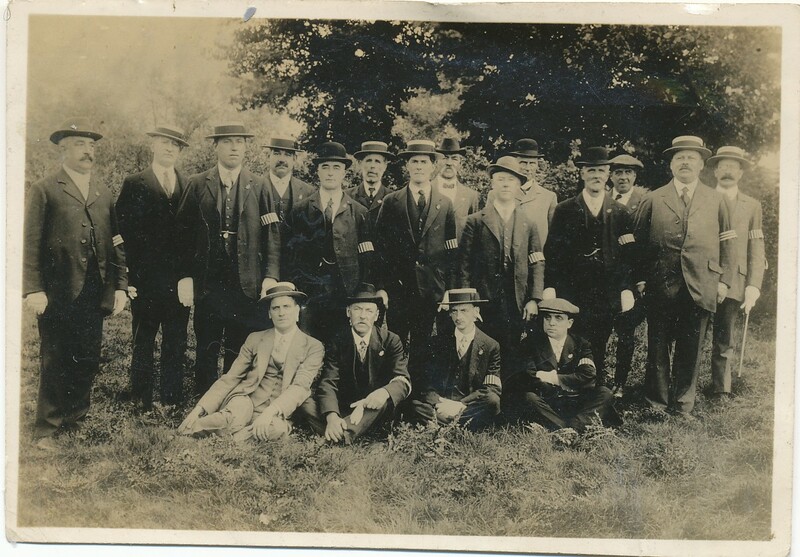 The South Benfleet Special Constables, probably at the end of the war. Just after Britain entered WW1 on 4th August 1918 the government passed a number of regulations. Among them was The Special Constables Act 1914 which was passed in Parliament on the 27th August 1914, received Royal Assent on 28th August 1914 and was in the London Gazette on 9th September 1914. Hansard records that “The special constables are being enrolled as a volunteer force, consisting of persons who, being unable to undertake military service, are desirous of rendering useful service to their country in the maintenance of public order.” The London Gazette further stated that “A special constable shall throughout the police area for which he is appointed, and also in any adjoining police area, have all the powers, privileges, and duties which any constable duly appointed has within his constablewick by virtue of the common law or of any statute for the time being in force.” So they would have the full powers of the police and would be directed in such duties as the local Chief of Police determined. There was a report in The Essex County Chronicle for 4th September 1914 that the Essex Standing Joint Committee met to review progress. It was reported that they had resolved to enrol Special Constables to aid the county police in the preservation of peace and good order. It would be composed of British citizens of good physique and not within the limits of age prescribed for the Territorial Force. They would form themselves into groups and appoint their own sergeant. They would be employed in their local area. The question of women serving was raised but the Chief Constable was adamant that it was not going to occur. The question of equipment was a problem. They would be provide with a truncheon and wear an armband on their left arm. However the Chief Constable stated that he already had 1,700 people enrolled but only had 1,000 warrant cards. He was short of truncheons, whistles and armbands. 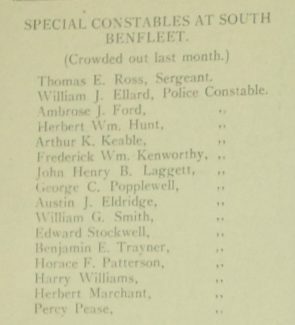 The July 1915 edition of the South Benfleet Parish Magazine reported 16 names who were South Benfleet Parish Constables. I have managed to find out something about 14 of them using the 1911 Census and the 1918 Electoral Roll. All their ages are given for 1915. Their sergeant was Thomas Ernest Ross who was 53 and a widower. He was a builder’s merchant living at the High Street in Benfleet. His son, George William Ross died at Gallipoli. William James Ellard who was 63 and married to Florence Caroline Ellard. He was a professor of music living at 3 The Terrace, South Benfleet. His son Bertram Arthur Ellard served during the war. Ambrose John Ford who was 47 and married to Ellen Mary Ford. He was colour merchant living at “Homelands”, Avondale Rd, South Benfleet. Herbert William Hunt about whom nothing has been found. Arthur Kelsdale Keable who was 55 and married to Rosa Margaret Keable. He was a merchant and agent living in London in 1911 but had moved to “Cordova”, Hopes Green South Benfleet by 1915. Frederick William Kenworthy who was 45 and married to Mary Margaret Kenworthy. He was a retired chemist living at “Kitscroft”, South Benfleet. John Henry Bishop Laggett who was 43 and married to Edith C B Laggett. He was a commercial traveller in glass bottles living in Leigh-on-Sea in 1911 but had moved to Benfleet in 1915. He probably lived at “Darling Grange”, which was the address of his son in 1918. He had moved away by 1918. His son John Bishop Laggett joined up on 12th September 1914. He reached the rank of Sergeant in the Royal Engineers and was awarded a Military Medal for “gallantry and devotion to duty in the field” on 19th July 1917. He served until 5th March 1919. George Cameron Popplewell who was 44 and married to Hettie Popplewell. He was a farmer and lived at Cross Farm, South Benfleet. He had two sons who when they were of age would most likely to have served. They were Hugh Cameron Popplewell and William George Cameron Popplewell. Austen James Eldridge who was 46 and married to Rose Ellen Eldridge. He had been a stock farmer in Black Notley in 1911 but had moved to Benfleet by 1915 where in 1918 he lived at “Highlands, High Road , South Benfleet. He had a son, Austen Garka Eldridge, who served during the war. William Grimwood Smith who was 49 and married to Julia Matilda Smith. He was a clerk and lived at 11 (The Anchorage), The Endway, South Benfleet. Edward Stockwell who was 47 and married to Laura Stockwell. He was a brick maker and lived at 2 Hopes Green, South Benfleet in 1911 and “Meadow View”, Town Meadow, South Benfleet in 1918. He had a son, Edward Stockwell, who may have served late in the war. Benjamin Elijah Trayner who was 42 and married to Margaret Elizabeth Trayner. He was a grocer and butcher dealer who lived in Gravesend in 1911 and somewhere in the High Street, South Benfleet in 1918. His son, Jack Trayner, served as a merchant seaman in the war and received a Mercantile Marine Medal. Horace Franklin Patterson who was 39 and married to Georgina Lizzie Annie Patterson. He was a corn merchants manager and lived at Woods Wharf, South Benfleet. His two sons were probably too young to serve by the end of the war. Harry Williams I have not been able to find out much other than he lived at “Fairfield Willows”, South Benfleet in 1918. Herbert Welsford Parker Marchant who was 34 and married to Emily Marchant. He was a business assistant in 1911 living in Poplar, London, but was in 4 Glen Villas, South Benfleet in 1918. Percy Joseph Pease who was 44 and lived with his parents and sister. He was a farmer and grocer and lived at 2 Glen Villas, South Benfleet. We have this photograph of the Special Constables probably taken at the end of the war. There are 18 people in the picture which means at least 2 more people joined during the war. 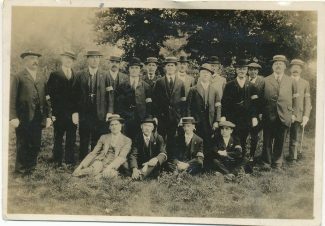 The only person who has been identified is Thomas Ross on the far left hand side. Three of the men in the photo have arm bands with horizontal stripes rather than vertical. As one of these is Thomas Ross and he is the Inspector it suggests that the other two were his Sergeants. 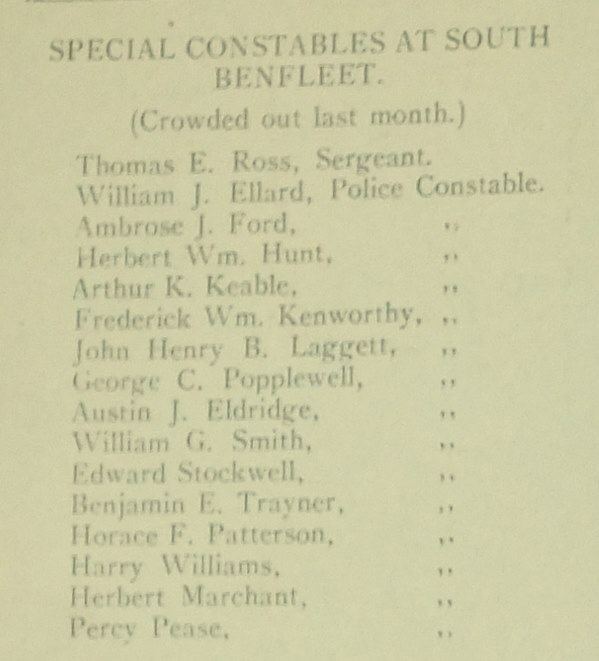 There is a newspaper report in The Essex County Chronicle for 10th January 1919 that the Benfleet Special Constables had had supper together at the Anchor Inn, with Inspector Thomas Ross presiding. This suggests that this was the final meal before they disbanded. A further Newspaper report in the Chelmsford Chronicle for 18th July 1919 states that the Essex Special Constabulary were released from service on Monday 14th July 1919. It pointed out that no patrol work had been done for some months but that the men were kept enrolled in case of an emergency. Each member received a letter of thanks from the Commandant, the Earl of Warwick, and from Capt. J.A. Unett, D.S.O., the Chief Constable of Essex.